You can’t always find Paleo-friendly foods at a tailgate party, so make these Sriracha Pineapple wings and be the hero! Keep with your Paleo goals and chow down on some sweet and spicy wings! You get the idea. Chicken not only lends itself to any flavor you want to put with it, but the wings allow you to forget the cutlery! Napkins too if you are lucky enough to have a team with dark colors! 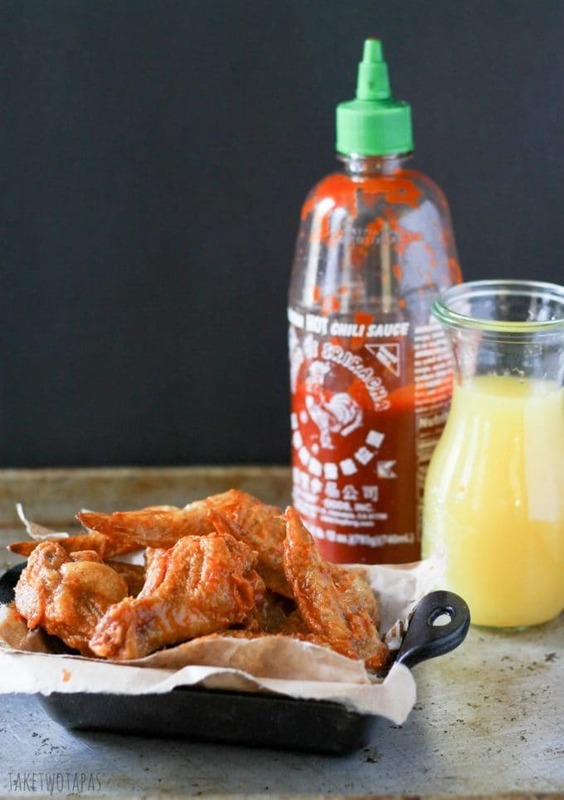 Sriracha is perfect for making chicken wing sauces because hot and spicy wings, in my opinion, are the best. If you can add a touch of sweetness, it makes them even better. The best way to sweeten is to use honey or fruit juice. This recipe uses pineapple juice for the sweetness and Sriracha for the heat. Rounded out with some Ponzu lime and salt! These Sriracha Pineapple chicken wings can be made/marinated ahead of time and cooked on location, or heated back up and they will still be great! 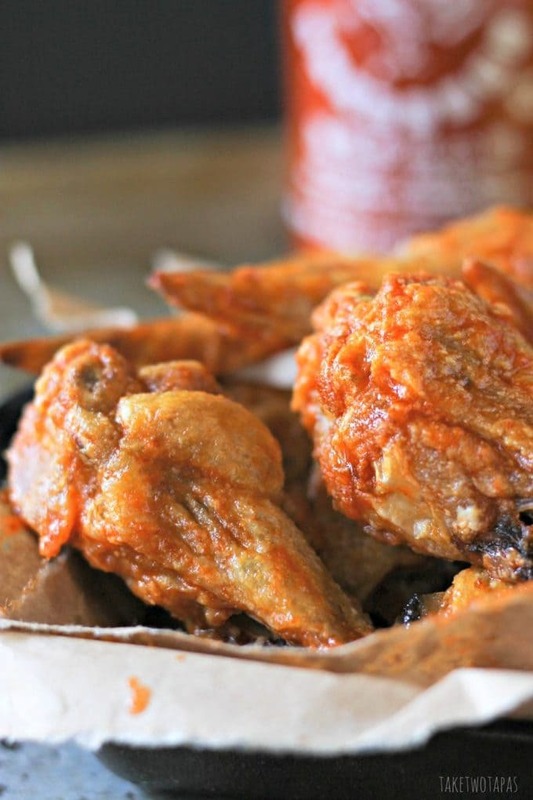 Try these wings are your next tailgating party. 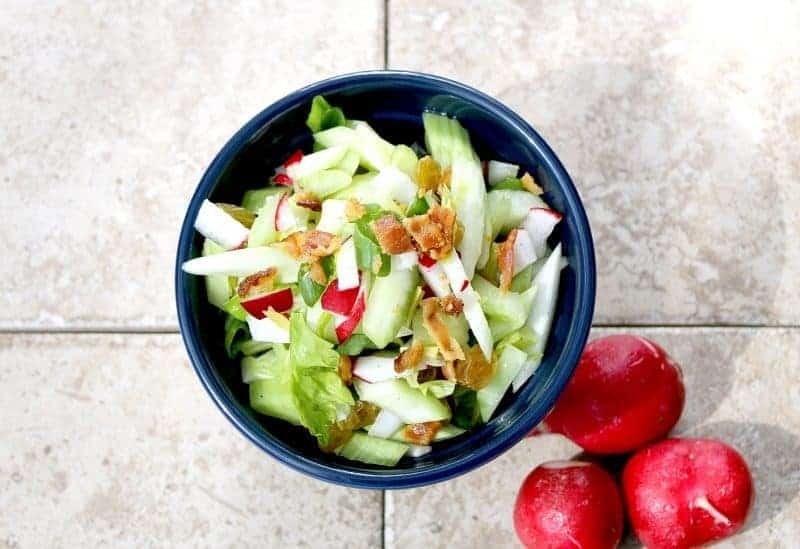 Pair it with my Crispy Celery Slaw if you are used to having celery and blue cheese! 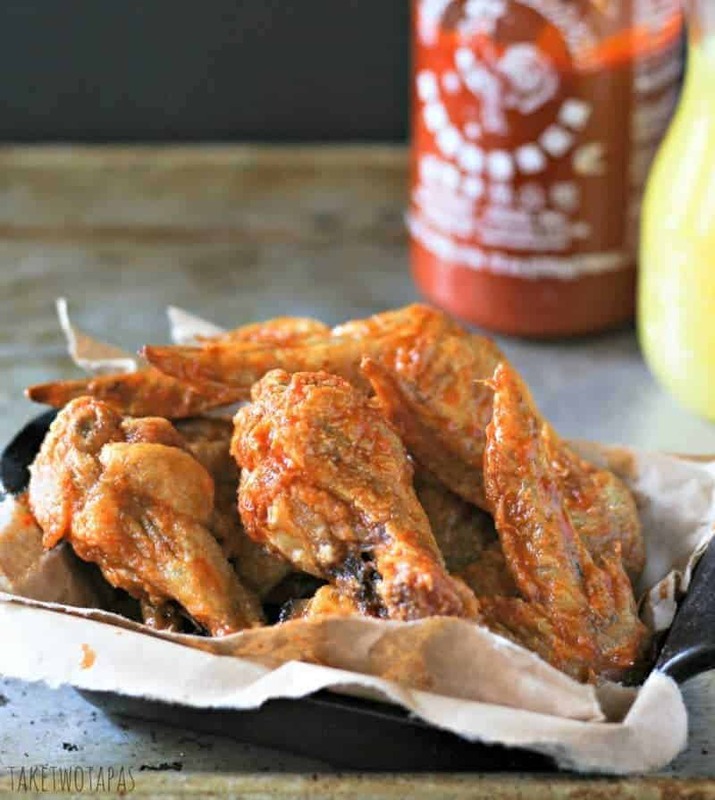 These Sriracha Pineapple wings are also Paleo friendly. Cavemen love my wings! 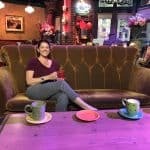 If you are strict Paleo or Whole30, you can eliminate the honey and just use the pineapple juice. You might also want to check the ingredients for Sriracha. Sugar is listed as an ingredient with 1 gram of sugar showing up on the label. If this is worrisome, you can always switch to your favorite hot sauce. If you feel like frying the wings, I would save some of the marinade (before you mix with the chicken) and then toss the wings in it after you fry them and before you serve them. Don’t use the marinade that you have the chicken soaking in for tossing it unless you bring it to a boil for at least 5 minutes. My Sriracha Pineapple Chicken Wings will be the slam dunk of your tailgating party! You can’t always find Paleo-friendly foods at a tailgate party, so make these Sriracha Pineapple wings and be the hero! Keep with your Paleo goals! Mix all ingredients together, chicken wings last, and marinate for 2 hours. Heat oven to 400 or heat your oil if frying. Cook on a foil-lined baking sheet for 30 minutes or until desired doneness. I like mine extra crispy! Broil on high to caramelize the honey and pineapple. Delicious!!! I LOVE wings. Sweet and spicy is my favorite combination. Yum, I love a good sweet and spicy combo. Love it! Thanks! Me too! Just like I love sweet and salty! Ummmm heck yes! I Love chicken wings and I’m a huge sucker for sriracha. I would totally dig this creation…yum! Thanks!!! I love sriracha too! Looks just fantastic! 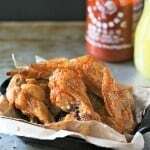 I use Sriracha like most people use catsup, so I know I would love these wings, YUM! I love it so much I need to get one of those sriracha keychains! Too hipster? Um, yum! Pinning cuz I absolutely love wings.